BP has managed to seal the smallest of the three leaks spilling oil into the Gulf of Mexico, the company says. 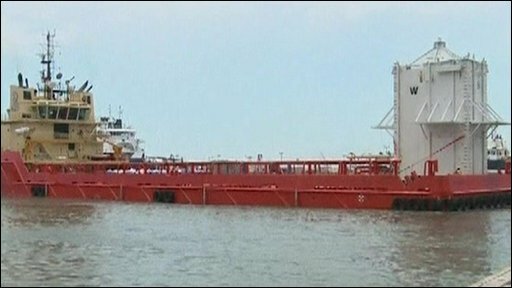 Oil is still gushing into the sea at a rate of about 800,000 litres a day, but officials say working with only two leaks makes tackling the spill easier. A controlled burn of the slick to remove oil from open water has also begun, AP news agency said. And a special containment box to funnel oil to the surface from the leaking well is being sent to the site. Engineers plan to lower the 100-tonne concrete and steel box over the site on Thursday, using remote-controlled submarines, officials say. BP has never deployed such a structure at a depth of 5,000ft (1,500m) and difficulties may occur, it says. The operation is expected to take more than two days. If successful, BP said it hoped to begin pumping oil to the surface early next week. Describing the cap, coast guard officer David Mosley told AP news agency: "It doesn't lessen the flow, it just simplifies the number of leak points they have to address." A burn was last tried on 28 April when thousands of litres of oil were successfully removed. Favourable weather conditions have now allowed crews to begin burning off more of the oil where it is most heavily concentrated, AP said. Concerns for the impact of the burn on wildlife in the area have been dismissed by the body co-ordinating the response to the spill. "No populated areas are expected to be affected by the controlled burn operations and there are no anticipated impacts to marine mammals and sea turtles," the Deepwater Horizon Incident Joint Information Center was quoted as saying by AFP. The spill was set off by an explosion that destroyed the Deepwater Horizon oil rig and killed 11 workers off Louisiana last month. A sheen of oil has already reached the shore in parts of Louisiana, but officials say coagulated crude oil is not expected to reach coastal areas until the end of the week, AFP reports. The National Oceanic and Atmospheric Administration (NOAA) said the oil slick was not expected to move much in the next several days. BP has told members of a US congressional committee that up to 9.5m litres a day could spill if the leaks worsen, AP notes.